I won't make any rye comments about treating their commuter-customers as freight. I hope they will not become "SDP70F's", and will not become wreck and rail breaker prone. Also, will HEP come from the prime mover, or a secondary gen set? I'm a little confused. Presumably Progress/EMD will be retrofitting (probably) ex-BN SD70MACs with HEP generators a la the Alaska Railroad's SD70MACs. Why is the rendering of a SD70ACe? I hope they will not become "SDP70F's", and will not become wreck and rail breaker prone. Again, you don't know what you are talking about! 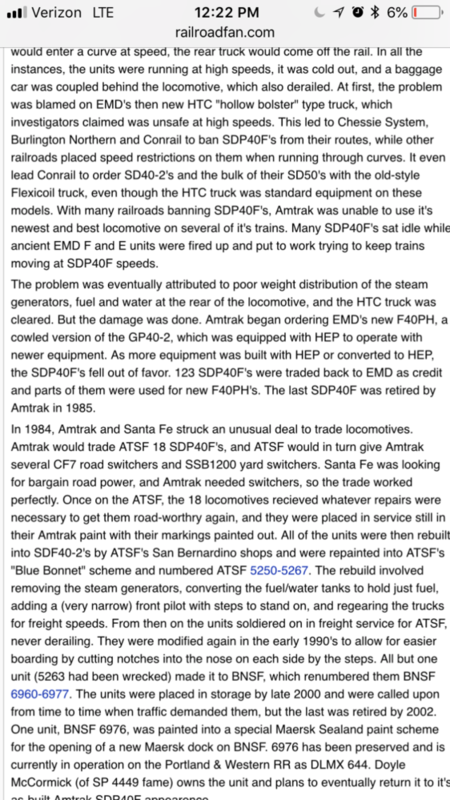 The old Amtrak SDP40F units didn't break any rails, and we only "derailment prone" on really crappy track, when coupled to a poorly maintained VERY light weigh Amtrak baggage car. Besides, the "70 Series" units have the Radial/steerable trucks anyway. Also, will HEP come from the prime mover, or a secondary gen set? Probably a separate inverter to provide HEP for the train. I'm a little confused. Presumably Progress/EMD will be retrofitting (probably) ex-BN SD70MACs with HEP generators a la the Alaska Railroad's SD70MACs. Probably not, as simply adding a separate inverter to provide 480 Volt HEP, as has been done previously. Why is the rendering of a SD70ACe? Maybe the METRA folks don't know any better? I’m a little confused by this decision. It’s clear that the idea was to go with cheap power and not spend a ton of money jumping on the Charger bandwagon, but why didn’t they purchase more F59PHRs and F59PHIs, or even more MP36PH-3Cs? Surely that would make more sense and be more efficient. They already have both of those locomotives which have proven themselves in service, so I don’t understand why they would go through all this trouble. I bet Hot Water knows something. These SD70MAC-Hs won’t have that problem as the SDP40Fs were top-heavy due to poor weight distribution. There have been many successful 6-axle passenger units. These SD70MAC-Hs won’t have that problem as the SDP40Fs were top-heavy due to poor weight distribution. Where did you come up with such a ridiculous claim? There have been many successful 6-axle passenger units. I’m a little confused by this decision. It’s clear that the idea was to go with cheap power and not spend a ton of money jumping on the Charger bandwagon, but why didn’t they purchase more F59PHRs and F59PHIs, or even more MP36PH-3Cs? Because EMD/Progress rail doesn't make 4 axle units anymore. Surely that would make more sense and be more efficient. They already have both of those locomotives which have proven themselves in service, so I don’t understand why they would go through all this trouble. Did you read the part of the press release concerning the trouble free AC traction motors vs. the old DC traction motors? I bet Hot Water knows something. Are F59's still being made? They’re not, but neither are SD70MACs. That’s my point. They could easily have purchased more F59PHRs or F59PHIs to supplement their current fleet instead of buying SD70MACs. I understand the AC traction part, but why go through all the trouble of converting them when they could have just bought more of what they already have? Well, whatever that is, I'm unable to read it. But then, if it's on the internet it MUST be true, right? The SDP40F units were NOT "top heavy", as the additional boiler water supply tank was mounted directly on the underframe, inside the carbody. When both the lower fuel & water tank plus the inside the carbody water tank were filled with water, the units total weight was close to 400,000 pounds, thus only certain railroads allowed Amtrak to utilize the carbody mounted water tank (there were supply valves, which were sealed, that would be opened for use on those railroads allowing the extra weight). The bottom line was, you can't operate a heavy, i.e. over 395,000 pound locomotive, no mater whether freight or passenger, over crappy track, at passenger train speeds. Like Hotwater mentioned, the AC traction was probably part of it. I also think there aren't that many F59PHIs or F59PHs on the used market right now. Metra bought their F59PHs (GO Transit) and F59PHis (Amtrak California and Cascades) because that was what was available, somewhat reliable, and cheapest at the time. The other operators of F59PH variants (AMT/Exo, Metrolink, Amtrak Piedmont, West Coast Express) are not currently selling their fleets (to my limited knowledge). MotivePower is offering the AC-traction, QSK95 powered MP54AC, but as noted above, new locomotives are expensive, and Metra seems to want EMD 710 engines that allow it to pay some lip service to reducing emissions and replace an aging fleet of F40 variants. I think Progress will use ex-BN SD70MACs because NS just returned several ex-BN executive livery leasers two months ago; I'm sure Progress is offering great financial terms to get rid of what was set to be for them an unproductive asset. The F125s were supposed to replace the F59s on Metrolink, which have slowly been taken out of service. So it’s very likely that if there aren’t any units for sale now there certainly will be very soon. While I realize they want 710 engines, the 710 in the SD70MAC is not the same as the 710 in the F59PHRs and F59PHIs. 12-710G3C-ECs could be cannibalized and swapped between locomotives, instead of being slightly limited in the parts they can share. According to the NTSB reports I read for SDP40F derailments since the internet isn’t valid info, the track was up to standard at the time so the track wasn’t crappy. I wouldn’t exactly call 40-50 mph “passenger train speeds”. At this point in time, the SDP40F failures are a moot point. Nobody uses steam heat anymore on any of the commuter lines or on Amtrak. Just for the record, we never had a track/train dynamics derailment of an SDP40F on Santa Fe, and we ran them long distances, fast. We even bought a group of them from Amtrak and re-fitted them for freight service. No problems at all. And I did not get this information from reading railfan magazines. I was there. It sounds to me like Metra is going to be getting a good deal on good locomotives. From what I understand, the SDP40Fs were only set up to do 95 mph so not sure how they would hit 100. Anyway I’ve done some further reading and it seems like Metra really didn’t have any other options. Apparently Metrolink’s F59PH fleet has to have their engine blocks destroyed as part of the provisions for the grant that gave them funding for their F125s, and the lease/for sale fleet is a lot more limited than previously thought. To be clear-I wasn’t against the idea because they were six axle units, was just against it because it would have made more sense and been more efficient to buy more of what they already had if it was available (which it apparently wasn’t). SD70MACs definitely wouldn’t have been my first choice if it was my decision to make, but if they’re ex-BN units they’ll at least be pretty reliable. Will be very interesting to see these in service. Looks like you "understand" incorrectly. They were good for at least 102 MPH on the Santa Fe. All that was done was a whole was drilled someplace in the crankcase (EMD two-stroke engines do NOT have "blocks", as the crankcase is a welded/fabricated assembly). Thus, that hole can easily be welder up. as part of the provisions for the grant that gave them funding for their F125s, and the lease/for sale fleet is a lot more limited than previously thought. To be clear-I wasn’t against the idea because they were six axle units, was just against it because it would have made more sense and been more efficient to buy more of what they already had if it was available (which it apparently wasn’t). That, of course, is only your opinion. So,,,,,,you have a wealth of Mechanical Engineering experience in the field of railroad motive power and associated interchangeability and reliability? but if they’re ex-BN units they’ll at least be pretty reliable. Will be very interesting to see these in service. Same here, as I hope they will be passing through our town, on the former Burlington 3 track main line. I'm sure my good friend, who left EMD and now is a manager at METRA, will keep me updated on these units, since I spent so much time with the SD70MAC units on the BN, out in the Wyoming Powder River Basin coal fields (1991 thru 1998), prior to my retirement. Well at least the SD70MACs will be back at home on the "race track". I remember them on coal trains as a kid. Lately it's been mostly GEs on everything, with the occasional SD70ACE. Although I'll miss the slanty nose FP40s. Well at least the SD70MACs will be back at home on the "race track". For what it's worth, the term "race track" is a rail enthusiast term. The CB&Q/BN/BNSF people refer to it as "The East End". I remember them on coal trains as a kid. Lately it's been mostly GEs on everything, with the occasional SD70ACE. Although I'll miss the slanty nose FP40s. Oh I know. I just figured more people would recognize the layman's term. Based on what choices they likely had, I'd say it's an EXCELLENT choice. AC traction, radial trucks, a track record of being used in passenger service (Alaska) and the fact that should they chose to do so, there are a couple of nice rebuild programs available out there that could bring these locomotives into the 21st century. With proper care, I'd be willing to bet they will outlive those fancy "door stop" passenger units they bought. I always thought they should have took their F40Cs and sent them through an SD32ECO rebuild program and kept using them. ......since I spent so much time with the SD70MAC units on the BN, out in the Wyoming Powder River Basin coal fields (1991 thru 1998), prior to my retirement. If you would indulge us please, of your opinion on the SD70MAC units overall. I have always been a modern diesel fan and not experienced with real trains. It is always good to read an experienced RR person's inside info. I feel that these units were the pivotal units leading the AC trend that seemed to take over now. Having no practical experience only leaves me to read up on what I can get my hands on. I haven't seen much comparisons of say the SD70MAC to the SD70M units for example. I have read some general comparisons to the GE's of the same time frame. During my 36 1/2 year career with EMD (June 1 1962 thru December 24, 1998) I always felt that the SD40-2/SD45-2 were the best units I ever worked with. Until the SD70MAC units! Sure the new new "MACs" had the typical "new design" bugs, especially the KNOR Electronic Airbrake system, but once the Semens people from Germany understood the unbelievable temperature extremes that the AC Inverters and their own computers had to work with, i.e. a coal train be loaded in the Powder River Basin of Wyoming at temps as cold as -35 degrees F, proceed to Houston Texas area, and unload the coal at 85 degrees F with 90% humidity, all within 3 days running time, the units became VERY reliable. In training the various Engineers and Road Foremen out of the Gillette, WY terminal, it quickly became apparent that a pair of SD70MAC units on the headend of 18,000 tons of coal, with another DPU SD70MAC on the rear, you could almost defy the laws of physics on the BN/BNSF Orin Subdivision. During the occasional "hot day", if the inverters got hot enough, they would automatically power-limit, and you would stall on the ascending grade. No problem; simply apply the train air brakes and stop, place the units in "neutral" and Reve the engines up to blow cooling air through the traction inverters. After about 10 or 15 minutes, you could call up the inverter temperature screen on the computer, and make sure that they had cooled down to "normal". Then, with the air brakes still set, place the rear DPU in forward throttle 6, and the lead units in forward throttle 6, thus straining against the train, so then when the air brakes are released, the train will NOT roll backwards. As the brakes release, the rear DPU is placed in throttle 8, and the lead units placed in throttle 7. Still holding the independent brakes on, when the train is fully released and the rear DPU begins pushing in any slack, ease down the independent brakes to about 30 psi, and place the lead units in throttle 8. Ever so gradually the train begins to move forward up the grade, as the Engineer lowers the independent brake down to about 10 pis, they all the way off. There is no wheel slip, and the train slowly accelerates up the grade to about the balance speed of 10 to 15 MPH. Such action with DC traction SD40/SD40-2 units would pretty much destroyed all the DC traction motors, by causing massive stall burns on the copper commutators. No problem for an AC traction SD70MAC! Having no practical experience only leaves me to read up on what I can get my hands on. I haven't seen much comparisons of say the SD70MAC to the SD70M units for example. The SD70MAC units are AC traction, while the SD70 is DC traction. I have read some general comparisons to the GE's of the same time frame. Hotwater, I just eat this stuff up! Tnx for posting real experience with AC traction motors. Always great to hear and learn from you. Any idea if these units will have desktop or traditional controls? HW, does EMD still have the SD60MACs? Since the former BN/BNSF SD70MAC units do have the full width nose and "super cab" with the desk-top control arrangement, one would assume that these re-manufactured units would retain that arrangement. I have no idea what happened to them. EMD converted them to test beds a few years back like the NS100/CRQ1. On a side not, hopefully Athearn makes these units in HO as I would almost definitely get one or two. Those should be interesting to see in commuter service! We take Metra all the time into the city!